Over the years, we’ve been a strong advocate for living roofs. Their beautiful form graces many of our projects as well as our home and office. The appeal is many-fold: Living roofs replace the ecology disturbed by buildings by moving it upward – to the roof level. 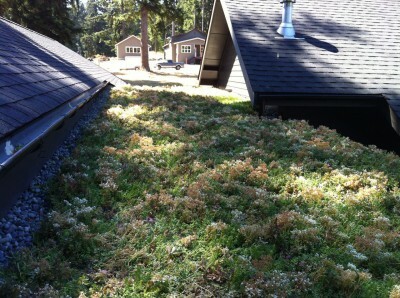 There, planted roofs provide habitat, carbon sequestration and oxygen. They reduce and filter stormwater. They extend the life of roof coverings (up to 2x) by shielding them from UV, environmental wear, and extreme temperature. Plants add a dynamic element as well. They change with time and seasons and the resulting beauty provides considerable psychological benefit. We like the way that they help to connect us to the natural world. During migrations, we often find flocks of birds resting on our roof as they take a break before flying on. We’ve explored many different ways to build a living roof and finally had the opportunity to utilize Blooming Nursery’s Greenfeathers system. It’s by far the quickest installation that we’ve seen and the result is a completely grown in roof – all in the course of a day! The secret is in planning ahead. 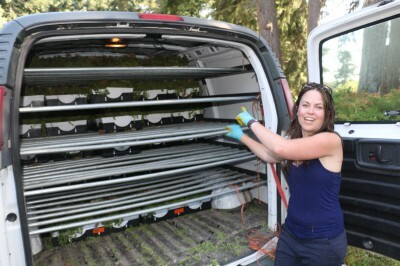 The Greenfeathers system is a series of modular 1’x2′ trays that are pre-grown at the nursery. The designer specifies the right plant mix (based upon climate, sun exposure, aesthetic requirements, drought tolerance, etc). The nursery then grows the flats ahead of time at their facility. Hence the planning ahead – it takes several months to grow the plants to maturity. Once they are ready, the flats are delivered and ready for installation. Installation is fast. The roof we planted was a few hundred square feet and took about half a day. Add a complimentary layer of material to protect the membrane from puncture during installation. 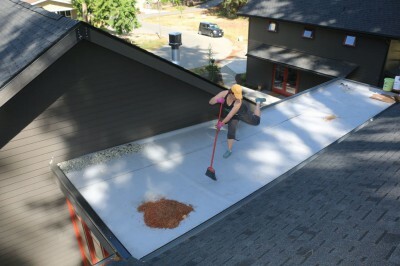 In our case, we used a second layer of loose laid TPO roofing (ballasted by the planted roof materials). Use drain rock around the perimeter, scuppers, drains, and building edges where you don’t want plant materials to deteriorate other parts of the building such as cladding or trim. Install the plant trays in a tightly fit configuration (measure the roof ahead of time and plan your layout). Remove the edge liners from the trays. This will allow the plants and soil media to blend together between trays so that the roof can grow together into one densely grown mat. Water in the roof deeply and intermittently as recommended until the plants are established. While at first blush, the system seems more expensive than other DIY installations, it may in fact be cheaper (especially for smaller roofs). 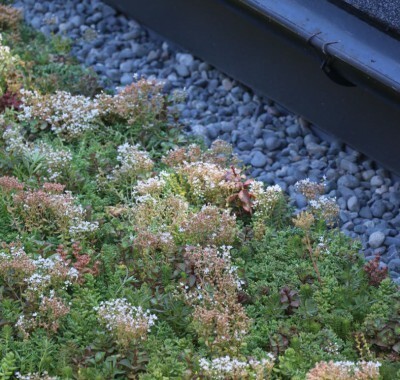 Finding and procuring good roof soil can be difficult and time consuming – as can finding an adequate supply of plants suited to your roof. If you are planning well in advance, you may be able to coordinate with other projects in your area and thereby share the delivery cost. Speed is a big advantage with this system. 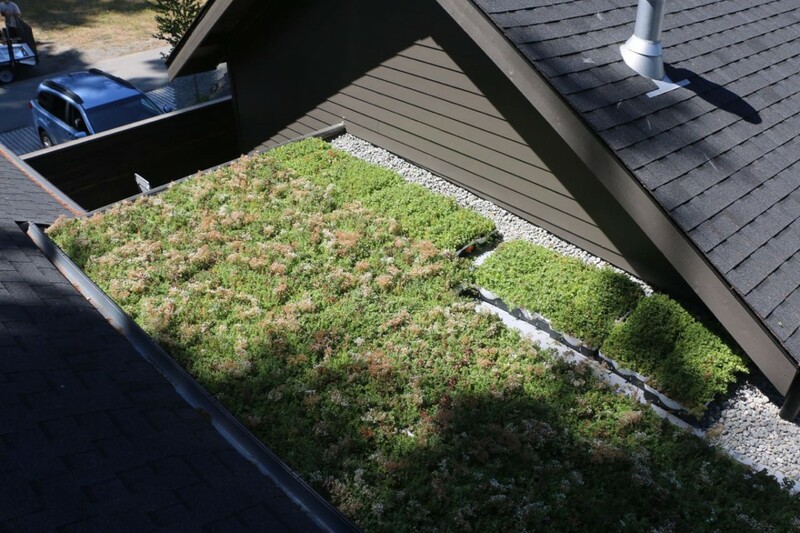 By having fully grown in plants, the roof soil is never exposed to weed seed – which virtually eliminates the likelihood of invasive plants establishing themselves on your roof. Dandelions and other aggressive interlopers can put strain on your waterproofing membrane, so keeping them at bay is important. Since roofing soils are not exposed for any length of time, they don’t need to be protected from erosion. 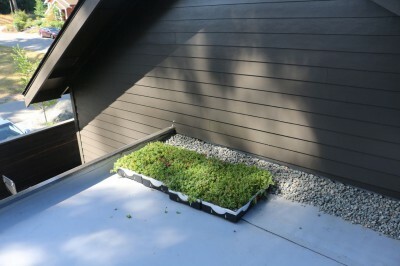 Further, the grown in materials are suitable for steeper roof installations (where baffles would be required to keep soil from sloughing off the roof). Finally, installing fully mature plants means instant benefits: Stormwater retention, oxygen production … you name it! One consideration we weighed was the additional plastic prevalent in the trays that are installed with the plants. Upon reflection, we realized that virtually the same amount of plastic is used for tray delivery at nurseries where the plants are grown, delivered and sold. So, unless you are installing plugs or cuttings the resulting embodied energy is about the same. The benefit of this system is that the installed trays do act as a root stop barrier and will facilitate the removal and replacement of the plant materials if and when the roof membrane needs to be replaced. Overall, we were quite pleased with the experience. Designing far enough ahead of time, we were able to choose just the plants that we wanted (rather than the ones commercially available at the time). The speed of installation was a huge plus … and the satisfaction of seeing a complete roof after only a few short hours was priceless.